Last night Bob Hughes, long time beekeeper entertained our group taking about his passion for bees. Bees are the primary pollinators for many of our important food crops and as a byproduct, excess honey can be gathered for human use. Did you know that a colony – two of these boxes are home to 60-80,000 bees. 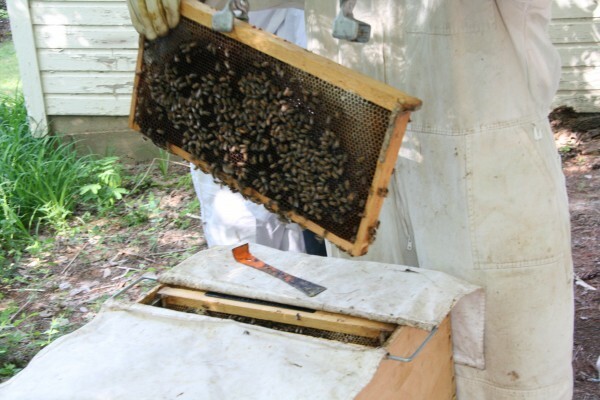 Beekeepers add extra boxes on top during the busy food collecting season. Bees can generate about four pounds of honey on each frame or about 45 pound of excess honey. Beekeepers must watch what’s happening in each hive or colony to make sure there’s enough room. If it gets too crowded, a swarm will set off for a new dark location. 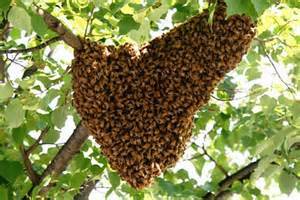 The swarm will rest on a tree while searcher bees go out looking for a new site and once located the swarm will follow. 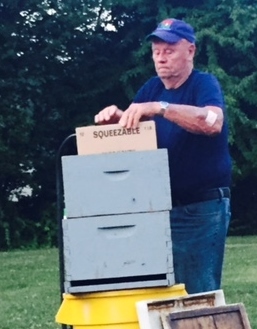 Beekeepers like Bob get calls from frantic homeowners to deal with a swarm. Bob suggested if you want to help out the bee population, you let dandelions grow in your lawn. These are a bees favorite. When asked, how can you be sure of the type of honey (clover, wildflower, orange blossom)? Bob replied that bees don’t travel too far so if they’re close to a field growing a single type of flower, it’s surely that flower type. Pollinating beekeepers move bee colonies at night and at least three miles away so they learn their new spot. After an interesting Q & A, we had the opportunity to taste local honey and left with a new appreciation for the work of bees.